The quality of controlled trials is of obvious relevance to systematic reviews. If the “raw material” is flawed then the conclusions of systematic reviews cannot be trusted. Many reviewers formally assess the quality of primary trials by following the recommendations of the Cochrane Collaboration and other experts. 1 2 However, the methodology for both the assessment of quality and its incorporation into systematic reviews and meta-analysis are a matter of ongoing debate.3-5 In this article we discuss the concept of study quality and the methods used to assess quality. Quality is a multidimensional concept, which could relate to the design, conduct, and analysis of a trial, its clinical relevance, or quality of reporting.6 The validity of the findings generated by a study clearly is an important dimension of quality. In the 1950s the social scientist Campbell proposed a useful distinction between internal and external validity (see box below). 7 8 Internal validity implies that the differences observed between groups of patients allocated to different interventions may, apart from random error, be attributed to the treatment under investigation. In contrast, external validity, or generalisability, is the extent to which the results of a study provide a correct basis for generalisations to other circumstances. In itself, there is no external validity. The term is only meaningful with regard to specified “external” conditions, such as other patient populations or treatment regimens. Internal validity is a prerequisite for external validity: the results of a flawed trial are invalid, and the question of its external validity becomes redundant. Internal validity is threatened by bias, “any process at any stage of inference tending to produce results that differ systematically from the true values.”9 In clinical trials, biases fall into four categories: selection bias, performance bias, detection bias, and attrition bias (box). Performance bias occurs if additional treatment interventions are provided preferentially to one group. Blinding of patients and care providers prevents this type of bias and also safeguards against differences in placebo responses between the groups. Detection bias arises if the knowledge of patient assignment influences the assessment of outcome.15 This is avoided by the blinding of those assessing outcomes—for example, patients, care providers, radiologists, or end point review committees (box). Deviations from protocol and loss to follow up often lead to the exclusion of patients after they have been allocated to treatment groups, which may introduce attrition bias. Possible deviations from protocol include the violation of eligibility criteria and non-adherence to treatments. Loss to follow up refers to patients becoming unavailable for examinations at some stage during the study period because they refuse to participate further (also called drop outs), cannot be contacted, or clinical decisions are made to stop the assigned interventions. Patients excluded after allocation are unlikely to be representative of patients remaining in the study. For example, patients may not be available for follow up because they have an acute exacerbation of their illness or severe side effects.16 Patients not adhering to treatments generally differ in respects that are related to prognosis.17 All randomised patients should therefore be included in the analysis and kept in their original groups, regardless of their adherence to the study protocol. In other words the analysis should be performed according to the intention to treat principle, thus avoiding selection bias. 16 18 This implies that the primary outcome was recorded for all randomised patients at the prespecified times throughout the follow up period.19 If the end point of interest is mortality from all causes this can be established most of the time. It may, however, be impossible retrospectively to ascertain other binary or continuous outcomes, and some patients may therefore have to be excluded from the analysis. In this case the proportion of patients not included in the analysis must be reported and the possibility of attrition bias discussed. Results for double blinding were more heterogeneous: the two larger studies 20 22 found that estimates were on average moderately biased in open trials, whereas one of the two smaller studies showed no effect,21 and the other showed substantial bias associated with lack of double blinding (figure).23 To some extent the importance of blinding depends on the outcomes assessed. In some situations—for example, when examining the effect of an intervention on overall mortality—blinding of outcome assessment is irrelevant. Differences in the type of outcomes examined could thus explain the discrepancy between the studies. Furthermore, investigators' understanding of who exactly should be blinded in double blind trials varies,24 and this may also introduce heterogeneity. Two studies addressed attrition bias but used different definitions. 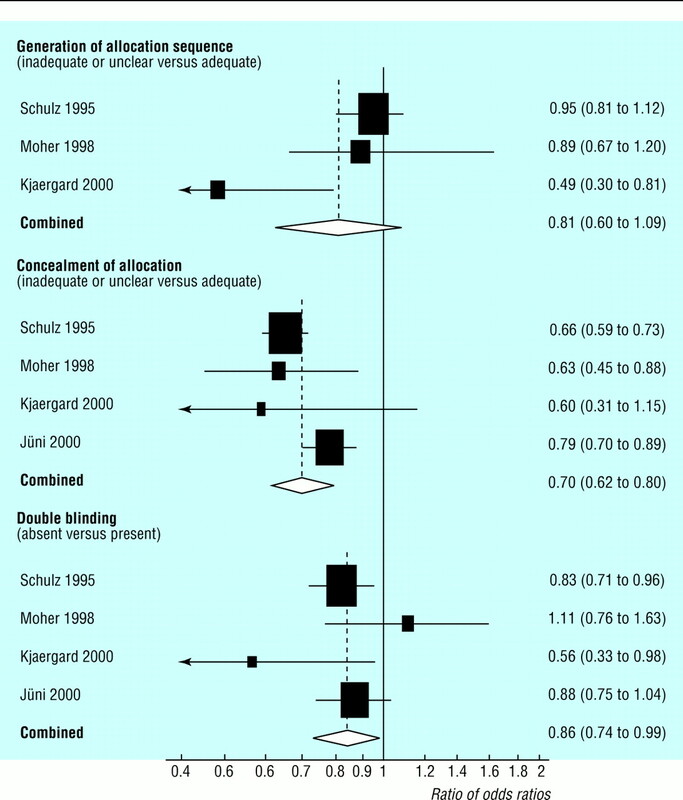 Schulz et al compared trials that reported exclusions with trials that either explicitly reported no exclusions or gave the impression that no exclusions had taken place.20 In contrast, Kjaergard et al compared trials that reported adequately on attrition (independent of whether exclusions occurred) to trials with inadequate reporting.23 Schulz et al found little difference in effect estimates (ratio of odds ratios 1.07, 95% confidence interval 0.94 to 1.21) whereas Kjaergard et al found a trend towards larger effect estimates in trials with adequate reporting (ratio of odds ratios 1.50, 0.80 to 2.78). 20 23 The methods used to assess attrition were unsatisfactory in both of these studies. Future research in this area should distinguish between quality of reporting and methodological quality and consider that some exclusions and losses to follow up may be unavoidable whereas others are clearly inappropriate. External validity relates to the applicability of the results of a study to other “populations, settings, treatment variables, and measurement variables”.8 External validity is a matter of judgment, which depends on the characteristics of the patients included in the trial, the setting, the treatment regimens, and the outcomes assessed (box).8 In recent years large meta-analyses based on data from individual patients have shown that important differences in treatment effects may exist between patient groups and settings. For example, antihypertensive treatment reduces total mortality in middle aged patients with hypertension, but this may not be the case in elderly people.25 The benefits of fibrinolytic treatment in suspected acute myocardial infarction has been shown to decrease linearly with the delay between the start of symptoms and the initiation of treatment.26 In trials of cholesterol lowering drugs the benefits of a reduction in non-fatal myocardial infarction and mortality due to coronary heart disease depends on the reduction in total cholesterol concentration and the duration of follow up.27 At the very least, therefore, assessment of a trial's applicability requires adequate information about the characteristics of the participants. The assessment of the methodological quality of a trial is intertwined with the quality of reporting—that is, the extent to which a report provides information about the design, conduct, and analysis of the trial.4 Reports often omit important methodological details. For example, only 1 of 122 randomised trials of selective serotonin reuptake inhibitors specified the method of randomisation.28 A widely used approach to this problem is to assume that the quality was inadequate unless the information to the contrary is provided (the “guilty until proved innocent” approach). This is often justified because faulty reporting generally reflects faulty methods. 20 29 A well conducted but badly reported trial will, however, be misclassified. An alternative approach is to explicitly assess the quality of the reporting rather than the adequacy of the methods. This is also problematic because a biased but well reported trial will receive full credit.30 The adoption of guidelines on the reporting of clinical trials has recently improved this situation for several journals, 31 32 but deficiencies in reporting will continue to be confused with deficiencies in design, conduct, and analysis. How the quality of trials should be assessed is being debated. Quality scales combine information on several features in a single numerical value, whereas the component approach examines key dimensions individually, without calculation of a score. Moher et al reviewed the use of quality scores in systematic reviews published in medical journals and the Cochrane database of systematic reviews.33 Trial quality was assessed in 78 (38%) of the 204 reviews from journals, of which 20 (26%) used components and 52 (67%) used scales. By contrast, all 36 reviews from the database assessed quality, of which 33 (92%) used components and none used scales. When the association of effect estimates with quality scores is examined, interpretation of results is difficult. In the absence of an association there are three possible explanations35: there is no association with any of the components; there are associations with one or several components, but these components have so little weight that the effects are lost in the summary score; or there are associations with two or more components, but these cancel out so that no association is found with the overall score. On the other hand, if treatment effects do vary with quality scores then investigators will have to identify the component or components that are responsible for this association to interpret this finding. The analysis of individual components of trial quality overcomes many of the shortcomings of composite scores. The component approach takes into account that the importance of individual quality domains, and the direction of potential biases associated with these domains, varies between the contexts in which trials are performed. It makes intuitive sense to take into account information on the quality of studies when doing systematic reviews. One approach is to exclude trials that fail to meet some standard of quality. This may often be justified but could exclude studies that might contribute valid information. It may therefore be prudent to exclude only trials with gross deficiencies in design—for example, those that clearly failed to study comparable groups. The possible influence of study quality on effect estimates should, however, always be examined in a given set of included studies. Several approaches have been proposed for this purpose. The most radical approach is to directly incorporate information on study quality as weighting factors in the analysis. Study weights can be multiplied by quality scores, thus increasing the weight of trials deemed to be of high quality and decreasing the weight of those of low quality. 3 21 A trial with a quality score of 40 out of 100 will thus get the same weight in the analysis as a trial with half the amount of information but a quality score of 80. We thank Ken Schulz and Lise Kjaergard for unpublished data and Iain Chalmers for useful comments on an earlier version of this paper. Funding PJ is supported by the Swiss National Science Foundation. The work on trial quality in Bristol was supported by the NHS Research and Development Programme. eds.Cochrane reviewers' handbook 4.0. In: Cochrane Collaboration.Cochrane Library.Oxford: Update Software,1999. .Methodologic guidelines for systematic reviews of randomized control trials in health care from the Potsdam consultation on meta-analysis.J Clin Epidemiol1995;48:167–171. .Incorporating variations in the quality of individual randomized trials into meta-analysis.J Clin Epidemiol1992;45:255–265. .Assessing the quality of randomized controlled trials: an annotated bibliography of scales and checklists.Controlled Clin Trials1995;16:62–73. .The hazards of scoring the quality of clinical trial for meta-analysis.JAMA1999;282:1054–1060. .Assessing the quality of controlled clinical trials. 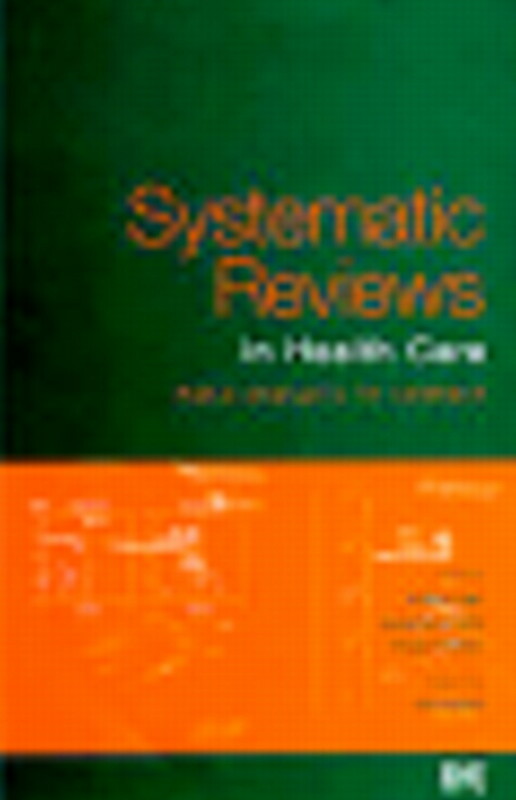 In: Egger M, Davey Smith G, Altman DG eds.Systematic reviews in health care: meta-analysis in context2nd ed.London: BMJ Books,2001. .Factors relevant to the validity of experiments in social settings.Psychol Bull1957;54:297–312. .Experimental and quasi-experimental designs for research on teaching. In: Gage NL ed.Handbook of research on teaching.Chicago: Rand McNally,1963:171–246. .The logic of medicine.Baltimore: Johns Hopkins University Press,1976. .Treatment allocation in controlled trials: why randomise?BMJ1999;318: 1209. .Randomisation. Essential for reducing bias.BMJ1991;302:1481–1482. .Amniotomy or oxytocin for induction of labor. Re-analysis of a randomized controlled trial.Acta Obstet Gynecol Scand1988;67:731–735. .Randomised trials, human nature, and reporting guidelines.Lancet1996;348:596–598. .Subverting randomization in controlled trials.JAMA1995;274:1456–1458. .The impact of blinding on the results of a randomized, placebo-controlled multiple sclerosis clinical trial.Neurology1994;44:16–20. .Controversy in counting and attributing events in clinical trials.N Engl J Med1979;301:1410–1412. .Influence of adherence to treatment and response of cholesterol on mortality in the CDP.N Engl J Med1980;303:1038–1041. .The randomized clinical trial: bias in analysis.Circulation1981;64:669–673. .What is meant by intention to treat analysis? Survey of published randomised controlled trials.BMJ1999;319:670–674. .Empirical evidence of bias. Dimensions of methodological quality associated with estimates of treatment effects in controlled trials.JAMA1995;273:408–412. .Does quality of reports of randomised trials affect estimates of intervention efficacy reported in meta-analyses?Lancet1998;352:609–613. .‘Garbage in - garbage out’? Assessment of the quality of controlled trials in meta-analyses published in leading journals. In:Proceedings of the 3rd symposium on systematic reviews: beyond the basics, St Catherine's College, Oxford.Oxford: Centre for Statistics in Medicine, 2000:19. .Quality of randomised clinical trials affects estimates of intervention efficacy. In:Proceedings of the 7th Cochrane colloquium. Universita S.Tommaso D'Aquino, Rome.Milan: Centro Cochrane Italiano,1999:57 (poster B10). .Physician interpretations and textbook definitions of blinding terminology in randomized controlled trials.JAMA2001;285:2000–2003. .Antihypertensive drugs in very old people: a subgroup meta-analysis of randomised controlled trials.Lancet1999;353: 796. .Indications for fibrinolytic therapy in suspected acute myocardial infarction: collaborative overview of early mortality and major morbidity results from all randomised trials of more than 1000 patients.Lancet1994;343:311–322. .Controversies in meta-analysis: the case of the trials of serum cholesterol reduction.Stat Methods Med Res1993;2:173–192. .Putting trials on trial—the costs and consequences of small trials in depression: a systematic review of methodology.J Epidemiol Community Health1997;51:354–358. .A quality assessment of randomized control trials of primary treatment of breast cancer.J Clin Oncol1986;4:942–951. .Meta-analysis: statistical alchemy for the 21st century.J Clin Epidemiol1995;48:71–79. .Use of the CONSORT statement and quality of reports of randomized trials.JAMA2001;285:1987–1991. .Value of flow diagrams in reports of randomized controlled trials.JAMA2001;285:1996–1999. .Assessing the quality of reports of randomised trials: implications for the conduct of meta-analyses.Health Technol Assess 1999;i3(12). .A method for assessing the quality of a randomized control trial.Controlled Clin Trials1981;2:31–49. .Quality scores are useless and potentially misleading.Am J Epidemiol1994;140:300–302. .Impact of study quality on outcome in placebo-controlled trials of homeopathy.J Clin Epidemiol1999;52:631–636. .Investigating and dealing with publication and other biases in meta-analysis.BMJ 2001 (in press).